BERLIN, 2015-4-1 — /Travel PR News/ — Rail technology leader Bombardier Transportation has signed a contract with National Express Group to provide maintenance for the new Essex Thameside franchise. This new franchise was recently awarded to National Express Group by the UK’s Department for Transport (DfT). 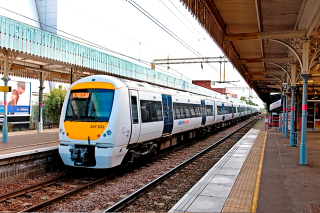 The contract, which is for a ten-year period with the option to extend another 5 years, covers maintenance and spare parts on 74 four-car Class 357 ELECTROSTARtrains and is valued at approximately £143 million GBP (196 million euro, $213 million US). Andrew Chivers, Managing Director Rail, National Express Group, said, “Bombardier Transportation is fully aligned in terms of driving improved fleet performance in support of National Express’ commitment to deliver excellent levels of service to its customers”. Bombardier Transportation’s approach to this new maintenance contract includes a number of initiatives designed to provide effective support and improve fleet performance. Aligned with National Express Group’s franchise performance and operational commitments, the new contract contains an incentivised performance regime and incorporates Bombardier’s Automatic Vehicle Inspection System (AVI System). Already in use at Bombardier’s Central Rivers (UK) and Gautrain Rail (South Africa) service depots, the AVI System is an integrated technology that uses a range of cameras and sensors to analyse and monitor a vehicle’s condition. Housed in a dedicated structure around and under the tracks, the AVI System helps operators lower costs by reducing component usage and maintenance interventions while increasing asset utilisation. This innovative system can also automatically generate maintenance work orders, provide advanced notification of component wear and even trigger safety alerts – all without the intervention of inspection technicians. With a strong fleet service track record in the UK, Bombardier Transportation already maintains fleets for National Express Group, East Midlands Trains as well as for Cross Country’s Voyager fleet, for which Bombardier has won a prestigious UK rail industry award, five years in a row, in recognition of the Voyager fleet’s reliability performance. Follow Bombardier Transportation on Twitter @BombardierRail. To receive our press releases, please visit the RSS Feedsection. BOMBARDIER, ELECTROSTAR, ECO 4 and The Evolution of Mobility are trademarks of Bombardier Inc. or its subsidiaries. This entry was posted in Business, Trains, Transportation, Travel, Travel Services, Travel Tech and tagged Andrew Chivers, Bombardier Transportation, maintenance for the new Essex Thameside franchise, National Express Group, Per Allmer. Bookmark the permalink.